Today the International Classical Music Awards 2019 (ICMA) were announced. 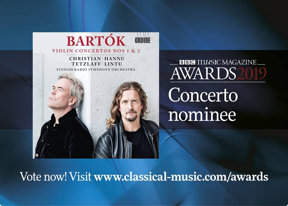 The Ondine recording of Bartók Violin Concertos (ODE 1317-2) with Christian Tetzlaff, Finnish Radio Symphony Orchestra and Hannu Lintu won the award in Concerto category. The same recording is also one of the three finalists in the BBC Music Magazine Awards 2019 announced today. It is shortlisted in the Concerto category. In September 2018 the same recording won also the Gramophone Award.